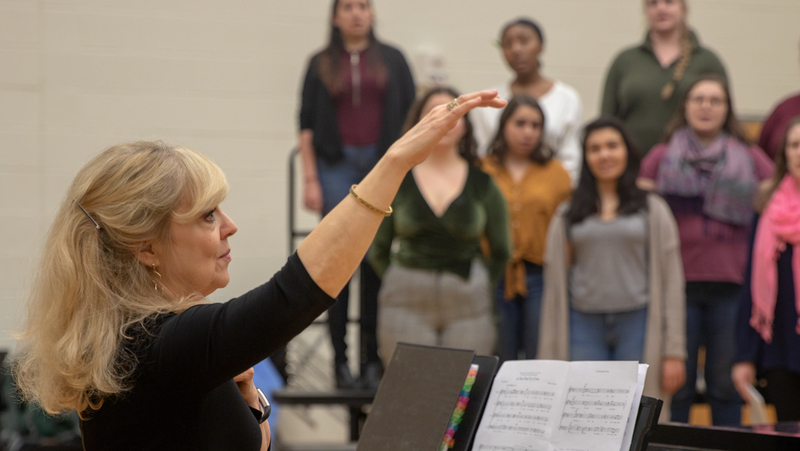 Janet Galván, professor in the Department of Music Performance, conducts the Ithaca College Choir in preparation for one of its performances. The choir will be performing "Considering Matthew Shepard" on April 16. Janet Galván, professor in the Department of Music Performance, has spent almost the entirety of Spring 2019 preparing the Ithaca College Choir for its performance of “Considering Matthew Shepard,” which she will be conducting, April 16. “Considering Matthew Shepard” is a composition by Craig Hella Johnson centered around the life and death of Matthew Shepard, a student at the University of Wyoming who was kidnapped and severely beaten Oct. 6, 1998, for being gay. He died six days later from his injuries. Shepard’s death helped spur an anti-hate movement in the United States and has been the subject of many forms of media. Johnson’s composition premiered in 2016, and he utilized details like the news coverage of the attack, the Westboro Baptist Church’s protestation of Shepard’s funeral and interviews of Shepard’s parents when creating it. The composition became available for other choral groups to use around the 20th anniversary of Shepard’s death. Meredith Burke: How did the decision to perform “Considering Matthew Shepard” come to be? MB: What went into preparing this performance? JG: We are doing all of it within class time, which is amazing. Just choosing the soloists … was the biggest jigsaw puzzle I’ve ever had to figure out because you want to get the best person for the solo, but, if at all possible, you want to spread the wealth so that more voices can be featured. Generally, everyone who wanted to do a solo was cast in some way. MB: How do you think performing this work has influenced your choir? MB: Why do you think it is important that the college do this performance now? JG: Look around you at what’s happening in the world. … I think my students are very frightened at the hate that is out there. They look around and they see people speaking very vociferously with comments that seem to be discriminatory. … I don’t want to get political because I don’t want people to think this is a political statement by any means — it’s a human statement. But I think even if you look at the way discourse is happening in this country — the idea of civil debate, we seem to have lost this. … For me, as an academic and an artist, disagreement is crucial. We disagree with people. … Even on that level, there’s this feeling of an unfriendly world, of an unsafe world. ‘I’m not safe to express my opinion. I’m not safe to go out to a bar because someone might not like me for whatever reason — because I’m gay, because I’m of a different color, because I’m of a different religion, because I might say something they disagree with politically’. … I think a lot of people feel a lack of humanity in the world. MB: What impact do you hope this performance will have on our campus community? JG: We want it to be a moment of hope, a moment of “let’s find a different way to approach this, let’s honor a memory, let’s make sure this doesn’t happen again”. … We’re presenting it in a context of realistic knowledge of what’s going on, and yet hope that your generation can change that. JG: I think Craig [Johnson] wanted it somehow to feel healing. Our dean talks about the role in music and medicine, and he often says that if you are a medical student, how you perform an appendectomy could well mean the difference between someone living or not living. As for people as artists, someone is going to walk into your performance on a specific evening and how you perform is going to determine whether they leave more healed and more whole or still broken and sick. We’re hoping this will be a healing event. Janet Galvan, professor of performance studies has been chosen as the new director of choral activities.